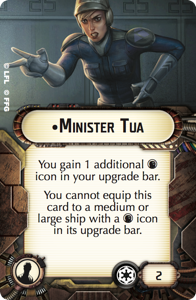 It's far past time that we took a look at the Wave 5 upgrade cards, and we're going to look at officers. Let's jump right in with the only non-faction specific officer. "When you resolve the CONTAIN defense effect, you can prevent the attacker from resolving any critical effects." Hey, it is the hard counter for Assault Proton Torpedoes! And also other weapon based upgrade cards. It does have only a limited number of ships that it really works on - for the Rebels, the MC80 Home One Class, or the MC80 Endeavor title. The Imperials get slightly options with the Imperial Class Star Destroyer, the Interdictor, and the Arquitens Light Cruiser. 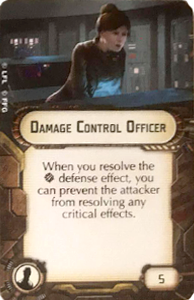 The biggest downside to the Damage Control Officer is that it competes with other officer upgrades for the one slot on the two largest ships of either faction, and there is no guarantee that the upgrade will actually be effective against your opponent. However, in a world with Assault Proton Torpedoes, Norra, Nym, Ion Cannon Batteries, and the occasional Overload Pulse or Assault Concussion Missiles, can you afford not to take it on your biggest ship? "Before you suffer damage from an attack, you may exhaust this card to reduce the total damage by 1." 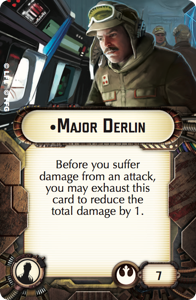 By far the MVP of my Pittsburgh Regional list, Major Derlin is like a lite version of Bright Hope, but for any ship you have, and only once per round use. Still, even at 7 points, a big ship that is going to be shot at every round, and has a ton of staying power, Major Derlin will earn his points back and then some. I personally think his defensive ability works extremely well with the MC80 Liberty Class, a ship that is guaranteed to be flying into the middle of the fight, and have the staying power to take a decent beating over several turns. Also consider it on an MC80 Home One class, or an Assault Frigate - anything that can Brace damage down to make that point of damage worth more. Less useful on the small base Rebel ships, the ones that don't like to take a lot of fire. Nearly worthless on any Flotilla not named Bright Hope (double reduction of damage on the off chance something is able to hit it), and not particularly useful on the CR90 or MC30c. The Pelta and Nebulon B are interesting options for him as well. The double Brace of the Nebulon B offers some survivability. The Pelta does have a Brace but no defensive retrofit to guarantee its use with Electronic Countermeasures, and in my experience dies very quickly to concentrated fire. 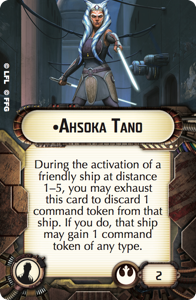 "During the activation of a friendly ship at distance 1-5, you may exhaust this card to discard 1 command token from that ship. If you do, that ship may gain 1 command token of any type"
Option 1: Raymus Antilles - Generate tokens every turn, and turn it into the token you need. Need to change speed? Swap over to navigate. Need a shield? Engineering time. Oh god I just need to activate that specific squadron? Squadron. I guess rerolls are cool too. Concentrate Fire! Total cost: 9 points. Option 2: Garm Bel Iblis - Gonna have a LOT of tokens to change into what you need them to be. Ever wish you could double or triple up on specific Garm tokens? Well, with Ahsoka you effectively can. Go speed 3, speed 1, speed 3, speed 1 with a Liberty. Engine Tech your Home One every turn while you spam squadron commands. How many turns do you really need to Entrapment Formation or All Squadrons Follow Me with a Pelta anyway? Total Cost: 7 points more than General Dodonna. Option 4: Just use Ahsoka as an emergency dial changer - Did you plug in a squadron command but you REALLY need to slow down? Did you spam navigates but you know you won't get away, and an extra shield would help keep you alive? Just want that reroll because lets face it, you aren't getting shot at and you're going the right speed? Ahsoka makes your mistakes into miracles. Total Cost: 4 points less than Navigation Officer. Personally I like her the best with Garm in a very specifically tuned list. Like one that is planning on spamming a specific Pelta Command, or that really wants a LOT of fighter activations. "You gain 1 additional Defensive Retrofit icon in your upgrade bar. You cannot equip this card to a medium or large ship with a Defensive Retrofit icon in your upgrade bar." Well, first off the "medium ship" is obvious future proofing. The only ship she cannot go on is the Imperial II-Class Star Destroyer. Actually let's talk about medium ships. Specifically giving Electronic Countermeasures to Victory Class Star Destroyers and Interdictors. Wow. Just... wow. Sure it's a moderate investment in points, but it makes them even more survivable than they usually are, though one could argue Damage Control Officer is a better Interdictor upgrade for what kind of engagements they should be getting into. Even the Imperial I-Class Star Destroyer benefits from the upgrade. Motti and Reinforced Blast Doors make for a hilariously survivable tank, though Electronic Countermeasures may still be the winner for most damage reduced. Could this work with a Gladiator? Perhaps. Again, Reinforced Blast Doors works well with Engine Tech users, and first/lasting with one would be a hell of a lot of damage without the drawback of ramming so many times, maybe more benefit than Intel Officer would provide for the same price. Having her on a Gozanti with your Commander on board could guarantee at least one scatter, giving a lot of survivability to your lifeboat. Not sure she's worth it for the Raider, and what on earth do we need multiple Defensive Retrofits for on an Arquitens?